Catwalk has been a professional hair care company for decades. Operating 3 salons in Sydney, folks at Catwalk have accrued the essential experience that money can’t buy. In fact, it is this essential experience that has gained Catwalk the reputation of being Australia’s no.1 online hair and beauty retailer. Being local helps Catwalkto to truly understand their Aussie customers which in turn reflects into an enjoyable shopping experience. Catwalk’s customer service team sits right in the local Sydney office. If one item is purchased from this category – your ENTIRE order will be free of delivery charges. Products will be regularly added and removed from this category, they may be changed without notice. Please note, free delivery applies to Australia-wide shipping. International orders may incur additional charges. See all of Catwalk’s hottest deals, updated daily. Free samples, straight discounts, fantastic savings. Professional and dedicated staff has been one of the key factors of success at Catwalk when the first humble salon opened its doors in Sydney suburbia. Ever since this has been part of Catwalk’s excellent customer experience. Second success factor has been the wide range of hair and beauty products Catwalk sells in their salons and online. Folks at Catwalk value their customers a lot. Customers should be rewarded, they say. So this is why Catwalk have decided to offer a free gift with any order exceeding $30. And that is when you benefit from this promotion at Catwalk. If you are planning to purchase stuff that is most likely to sum up to $30 and over, head over to Catwalk’s promotion page and watch out for a special promotion that suits your needs. Each promotion has a unique promotion code. Copy the code of your chosen promo to your clipboard. You need to be logged in into your Catwalk account to redeem your code, though. If you don’t have an account yet, don’t worry. Just sign up with Catwalk and continue your shopping. Once logged in, enter the promotional code into the field of your drop down cart. All hair stylists there are dedicated to your hair and your beauty. Modern salons, well-educated staff and an elegant and relaxing ambiance is what Catwalk is. The focus is you and your beauty. Of course, they do use the best professional hair and skin products there are on the market. They are authorised ghd retailers, they have Babyliss, Thalgo, Moroccan Oil, TIGI, Urchin, Redken and many more in stock. 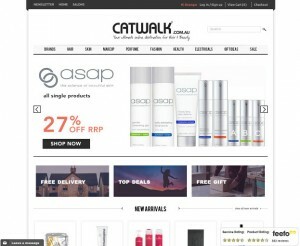 Catwalk offers professional hair and beauty products at an affordable price.